The traumatized six-year-old boy hasn't said one word since the unsolved murder of his single mother. And now, the killer is after the child—and the devoted uncle raising him, Dr. Dylan Seabrook. 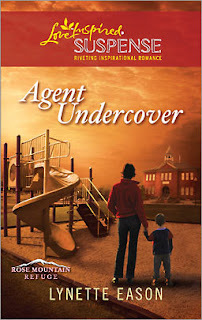 Working undercover in the boy's school, DEA agent Paige Ashworth is determined to find the murderer. But she can't tell Dylan her real identity, what she knows—or just how close to the case she really is. Dylan's strength and fierce love for his nephew soon have Paige longing to join their family. First, though, they must catch a killer who never wants little Alex to speak again. Undercover Drug Enforcement Agent Paige Ashworth, known as Paige Worth in the little town of Rose Mountain, North Carolina, realized she had only seconds to act or the child would be dead. Shoving her right foot down on the bicycle pedal, she ignored her pounding heart and the desperate fear that said she didn't have enough time. The little boy stood frozen in the middle of the school's crosswalk, eyes locked on the approaching vehicle. Time slowed until everything blurred except the child. The crossing guard yelled something and, from the corner of her eye, Paige saw the man to her left bolt toward the terrified boy. The agonized expression on his face revealed that he knew he wouldn't make it in time. "Will!" The hoarse scream tore from his throat, echoing in the air. Doing her best not to think about the danger, she pedaled furiously, weaving in and out of the few stragglers still on the sidewalk, and swept into the crosswalk. The sun beat down in her eyes as the car's engine screamed in her ears, warning her she would lose this game of chicken. Paige could feel the heat radiating from the vehicle as she reached out to snag the boy around his waist. She knew she would be off balance and would probably hit the ground. Her only thought was to get clear of the car. In spite of the muscles screaming in her right arm with the weight of the boy, she felt elation sweep through her. She'd made it. Then something clipped her back wheel. The bicycle handlebar lurched from her one-handed grasp and she lost control. Saw the ground coming up. And twisted at the last minute so she was the one who crashed first, the child's body slamming onto her. A sharp pain lanced the back of her head and then blackness descended. Doctor Dylan Seabrook shook with fear and adrenaline. "Will!" He raced to his nephew and grabbed him from his prone position on top of the woman who'd just saved Will's life. Dropping to his knees beside her, he did his best to assess the damage as quickly as possible. She wasn't moving, her face white like death, blond hair splayed on the ground. But he could see her breathing. With one hand, he felt for a pulse under her chin, even as his other ran over Will's small frame checking for injuries. He looked up at the nearest person. "Has someone called 911?" "I did," a voice said to his left. One person at a time, Dylan told himself. He gave Will a more thorough check and breathed a grateful sigh that he appeared physically unhurt, but the blank stare sent fear racing through Dylan. Will hadn't spoken in over eight weeks. Ever since his mother had died in a house fire. What would this do to him? But he couldn't think about that now. The woman was hurt. Again, he glanced at Will. The boy just watched him with no expression on his face. Dylan grabbed his hand and pulled him down next to him. "Sit here, buddy, all right?" Obedience, but no other response. Switching to doctor mode, he glanced at the second hand on his watch while he took the woman's pulse. Steady and strong. Relief hit him. As did the fact that she was undeniably beautiful. Beautiful and hurt. He'd not only seen her head crack against the asphalt, he'd heard it. Just the memory of it made him sick. Why hadn't she been wearing a helmet? With one hand, he lifted each lid, noting the startling blue of her eyes even as he professionally assessed her pupils. One big, one small. A concussion. A siren screamed in the distance. He placed a hand under her head to feel for a bump—and felt a warm wetness. Pulling his hand away, he wiped the blood on his jeans. A brief thought that he should have waited until he had gloves flashed through his mind, but he dismissed it. The woman had saved Will's life. He would do whatever he had to do to save hers. Sounds rushed at him, and he realized people were gathering around them in a crush. "Hey, move back and let her breathe, will you? " Several people complied. But the concerned conversations buzzed around him like a swarm of bees. Startled, he watched his nephew reach out and touch the woman's hand then slip his small fingers into her palm. Emotion gripped Dylan's throat and wonder exploded through him. But he didn't have to time to think about what Will's reaching out to her meant. Dylan wanted to examine the wound on the back of her head, but didn't want to turn her neck. He ran his hands down her arms, his gaze once again drawn to Will's small hand in hers. Then back to business. Scrapes, bruises, a couple of gashes but nothing broken. He repeated his inspection on her legs. Same story. His heart started to slow. No broken bones. He glanced at her white face. No doubt along with the bad concussion, she'd have an even worse headache. Hopefully, that would be the extent of her injuries except for a few bumps and bruises. The sirens continued to grow closer until the ambulance came into view. A man stood in the street directing traffic. Two police cars pulled up and one of the officers took over. The other approached, a frown on his face. Spying Dylan, recognition dawned. "What happened, Doc?" "Hey, Franco. She saved Will's life and got hit by a car for her trouble. The car kept going. Never put on the brakes, I don't think." "Anybody get a plate? " "I don't know. I know I didn't." "I'm going to start taking statements." Dylan acknowledged him with a nod and felt for her pulse one more time. The paramedics pushed their way through the crowd, and Dylan recognized Lisa Bell and her partner, Sam Clark. Dylan told them, "We need a neck collar. She wasn't wearing a helmet and she took a hard hit to the head. Her pulse is steady, and there are no broken bones that I could feel." The paramedics got to work on her. Soon she was ready for transport, and Dylan watched them load her up to be transported to the hospital about thirty minutes away in Bryson City. Turning, he asked, "Who is she? Does anyone know?" Dylan eyed the man who'd spoken. Principal Tom Bridges. "Does she have any family that we can contact?" Tom frowned and gave a shrug. "I don't know. I'll see who she listed on her application as an emergency contact. Today was supposed to be her first day on the job. She's my new guidance counselor." The ambulance screamed off, and Dylan picked Will up to hold him and hopefully offer the child some comfort. "Okay." He studied his nephew. "I think Will is okay, but I'm going to take him to the hospital just to make sure, maybe have a couple of X-rays. I'll check on Ms. Worth while I'm there." He pulled a card out of his wallet and handed it to the man. "I know you can get my number from Will's file, but this will be easier. Please call and let me know who her contact person is." Dylan swallowed. "I want to talk to him or her." Compassion lit the man's eyes. "Sure." Dylan headed back to his house for his car, feeling Will's slight weight in his arms. Giving thanks for the life he held, a life that was almost cut short, he settled Will in his booster seat and wondered how he'd ever be able to pay Ms. Worth back for her selfless deed. He decided he'd pick up her totaled bike and keep it for her in case she wanted to salvage it for parts. He made a quick call to Principal Bridges, who assured Dylan that he'd hold the bike for him. He started the car and pulled into the street. "Hey, Will, you all right, bud? " Will simply met his eyes in the rearview mirror. Dylan sighed, wondering when the child would decide to speak. But even Will's counselor couldn't offer him a time frame. She just said they had to give him his space and time to heal. Dylan noticed the car on his rear bumper. A car that looked suspiciously like the one that had almost hit Will. Dylan pressed the brake and slowed, giving the car the opportunity to go around him. Instead, the vehicle slowed to keep the same amount of distance between them. His pulse sped up and he swallowed hard. Dylan put on his blinker and moved into the right-hand lane. The car behind him did the same. Sweat pooled on his forehead as Dylan considered his options. He took a right at the next block. So did his tail. The dark tint to the windshield prevented him from getting a good look at the driver, but it was definitely a male. He glanced at Will. The boy was oblivious to the possible danger, simply gazing out his window, trusting his uncle knew what he was doing. Dylan flexed his fingers on the wheel and made the next turn that would take him to the police station two blocks away. And the car behind him sped away. There was no way to get a license number. He pulled into the police station parking lot and turned the car off. Pulling a napkin from the glove compartment, Dylan wiped the sweat off his face and gathered his thoughts. Should he go in and report the incident? What incident? he mocked himself. Someone followed you a little too close, then turned off. But the car resembled the one from this morning. "It was white." Will looked at him with a frown, and Dylan realized he'd spoken the words aloud. With a sigh and a prayer, Dylan turned the key in the ignition and pulled out of the parking lot. His eyes swept the surrounding area and didn't notice the white car waiting on him. The tension in his shoulders released its grip and he relaxed a bit. "Sorry for the winding route, Will. I just had to check something out." The little boy didn't respond other than to rub his eyes as though tired. Dylan may have decided not to report the incident, but knew he wouldn't forget it. Pain. That was her first thought. Her first feeling. Her first moment of awareness. It felt like shards of glass biting into her skull with relentless determination. Her eyelids fluttered, and she thought she saw someone seated on the chair next to her. Why was she in bed? Memories flitted back. Bits and pieces. A little boy. A school. A crosswalk. A speeding car. And she'd pedaled like a madwoman to dart in front of the car to rescue the child. A gasp escaped her and she woke a little more. The pain faded to a dull throb. Where was the little boy? Was he all right? opened her eyes. Light filtered in around the closed curtains, and she squinted, her head sending warning signals. Instead of listening, Paige pried her eyes fully open to stare into one of the most beautiful faces she'd ever seen. Aquamarine eyes crinkled at the corners, and full lips curved into a smile. She wanted to respond but was scared the movement would bring back the pounding pain. The lips spoke. "Hello. Welcome back." Another sweet face pushed its way into her line of sight. A little boy about six years old. Solemn blue eyes stared at her. His lips didn't smile, but a lone wrinkle on his forehead alerted her that he was worried about her. With an effort, Paige forced her lips to curve upward. "Hi," she whispered. The wrinkle smoothed, and she thought she saw the beginnings of a smile before it disappeared. The hand over hers squeezed. "You saved Will's life, you know." She had? Will. The little boy had a name. "Oh. Good." Her smiled slipped into a frown. "I was afraid I couldn't do it. That car…" She licked her lips, and the man reached over Will's head to pick up the cup. He held the straw to her lips, and she took a long swallow. "Thanks." He set the cup back down. "I'm Dylan Seabrook. This is my nephew, Will Price." The name jolted her. Doing her best to keep her expression neutral, she simply smiled at him. She wanted to nod but didn't dare. "Hello, Dylan, Will." She focused on the boy. "I'm so glad you're all right." "And he is, thanks to you. I tried…" He swallowed hard. "There's no way I would have been able to reach him in time. The crossing guard gave the all clear. Every day, I stand on the sidewalk and watch him cross to the waiting teacher who leads that group into the school." His voice had a raspy sound to it, and she realized he was doing his best to keep his emotions from overflowing. She flicked her eyelids up. "Did they catch him? Whoever was in the car?" Dylan shook his head. "No. He—or she—never stopped. And we were all so focused on getting you help that no one even got the license number." She sighed. "Well, I'm glad Will is okay. That's all that really matters." "Why didn't you have a helmet on?" Paige couldn't stop the flush that crept up her neck. Quite sure her cheeks were a rosy red, she said, "Because I—" She cut her eyes to the child who watched her with such a solemn expression. "I should have. It was very irresponsible of me not to have the helmet on. I got in a hurry and didn't grab it and then didn't want to go back and get it." She grimaced. "I won't make that mistake again. So—" she fingered the IV in her left arm "—when do I get to get out of here? " "We'll go tell the doctor you're awake." He took the boy's hand. "Come on, buddy." But Will pulled his hand from his uncle's and slid it into Paige's. Shock darkened Dylan's eyes, then they brightened and she thought she saw a flash of.hope? But Will didn't budge. Paige smiled around the sharp throb of the headache that had started to put in an appearance. "He's fine. He can stay with me if he wants to." Uncertainty flickered on his face, then he shrugged. "I'll only be a minute." Thank you for this! I love Lynette's stories!